Low knife profile doesn't create drag while finning when attached to calf. 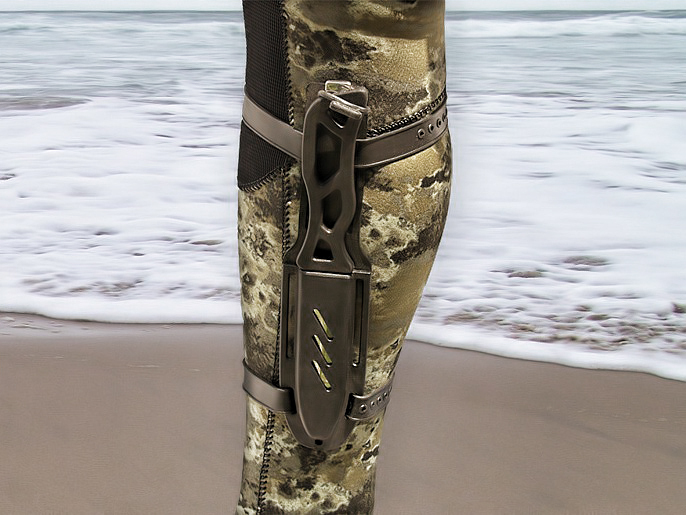 Stiletto blade is ideal for penetration. Serrated edge to cut mono, cable, or fish. The serrated edge easily cuts through 400lb mono and is capable of cutting through stainless steel cable. The blade is very stiff, it can be used to chip away rock to retrieve a stuck shaft, without fear of bending the knife tip or breaking the blade. Stainless steel blade, choice of Polished or Stealth (black teflon coated) which eliminates reflection of the sun and minimized the chance of attracting predators such as barracuda to the flash. 3 ways of securing the knife in the sheath; Using the built in rubber loop that goes over the end of the handle, the loop is removable. Using a bungee to loop over the tip of the sheath. Or both. 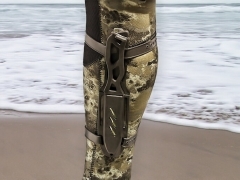 Sheath can be calf, thigh, or belt mounted. We prefer removing the rubber loop and using a bungee, we find it to be the most secure system. In an emergency the bungee is stretchy enough to pull the knife out of the sheath by force without first unlooping the bungee. Still the knife will never come out on its own. The bungee loop can be used to put your hand through when dealing with a strong fish to avoid dropping the knife if you lose your grip by accident. If knife is calf mounted make sure it's on the inside of the calf to reduce the possibility of entanglement with discarded fishing line.